Cash-strapped Hanjin Shipping Co. sources say that the negotiations with tonnage providers for lower rates are undergoing, but wouldn't say much else. According to Korea Herald, the country's No.1 shipping line has come under growing pressure from its creditors to secure more money to tide over a deepening cash shortage. Hanjin Shipping has proposed raising some 400 billion won ($353 million) via stocks sales to its affiliates, but creditors want the shipping firm to jack up the figure to some 700 billion won. South Korea's largest shipping line Hanjin Shipping has sold its entire 21.3% stake in Tan Cang Cai Mep International Terminal (TCIT) in Vietnam to its affiliate in order to secure liquidity. The financially-troubled shipping line will raise about $33m from the sale. The move came after the government and creditors, led by state-run Korea Development Bank, pushed Cho Yang-ho, the chairman of Hanjin Group, to pour more cash to the ailing shipping arm of the company. TCIT is a joint venture company of Saigon Newport Corporation with Hanjin, Mitsui OSK Lines and Wan Hai as partners. South Korea’s largest container operator by capacity Hanjin Shipping's creditors are expected to approve a corporate rehabilitation program for the struggling container line, local media reports suggest. Creditor banks of cash-strapped Hanjin are likely to give the ailing container carrier a chance to avoid bankruptcy by approving a corporate rehabilitation program, reports Korea Herald. Seven lenders, led by state-run Korea Development Bank, are expected to allow the country’s No. South Korea’s Hanjin Shipping Co. Ltd will work with lenders to restructure debt after years of weak demand resulted in losses and cash erosion, reports Bloomberg. The board of Hanjin Shipping decided to file for receivership and give creditors authority to manage the company, bowing to calls from the government and its main creditor Korea Development Bank (KDB) which asked Cho to accept heavy restructuring of the company. "Board directors of Hanjin Shipping decided to give up their management control for debt restructuring," said a KDB spokesman. Hanjin Group opened its creative economy innovation center in Incheon on Wednesday, hoping to develop the city into a distribution hub of Northeast Asia utilizing advanced shipping technologies. As part of the center, Hanjin created a fund worth 159 billion won ($138 million), with about 94 billion won to be used for loans to companies starting smart distribution businesses. President Park Geun-hye, Hanjin Group Chairman and CEO Cho Yang-ho and Incheon Mayor Yoo Jeong-bok attended the opening ceremony, held at the center’s location in Songdo, Incheon. 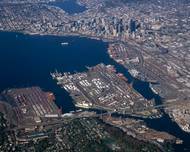 The Port of Seattle Commission approves lease extension with Total Terminals International (TTI), a J/V subsidiary of Hanjin Shipping & Terminal Investment Limited (TIL). The ten-year lease extension will secure continued volume and revenue at Terminal 46 for the next 13 years, through 2025. Hanjin Shipping, headquartered in Seoul, South Korea, is a subsidiary of the Hanjin Group, a large transportation conglomerate that includes Korean Air Lines. Hanjin is the largest container line in Korea and the 8th largest worldwide.